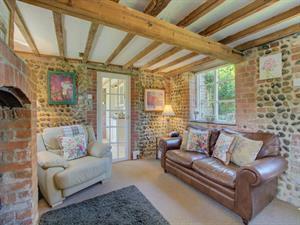 The Gig House is a beautifully presented, 200-year-old brick and flint cottage, nestled in the eastern coastal region of Norfolk, in the village of Ridlington. Sitting in mature grounds of half an acre, the cottage offers excellent accommodation with an oak beamed sitting room with woodburner, lovely kitchen/diner with French Doors to the garden and two delightful bedrooms on the first floor, under the eaves. The area is full of attractions for visitors; the sandy beaches of the east coast are still somewhat undiscovered and so relatively uncrowded even during the summer months, the northern tip of The Broads are close by where you will find windmills and tranquil spots of river to cruise along. There are lighthouses and piers to be discovered along the coast and numerous attractions to entertain all the family. The flat lie of the land under wide, open skies is a lure for cyclists, photographers, bird watchers and walkers alike. This unspoilt part of Norfolk is a great place to unwind and find yourself a breath of fresh air!